Part two of a two-part photo series. 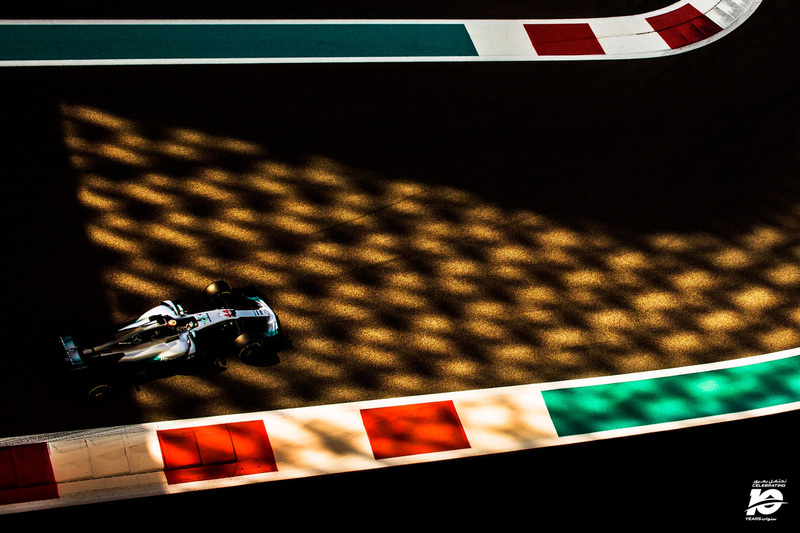 Darren Heath, world-renowned F1® takes us on a journey through time with photographs from 10 years of the Abu Dhabi Grand Prix. 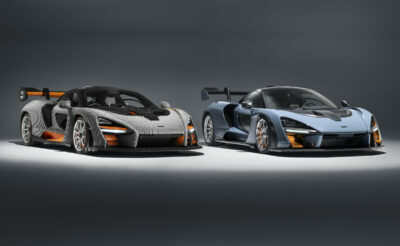 In this collection, Heath shared his favourite images of drivers on track, behind the scene at the pitstops, and beautiful scenery of the iconic Yas Marina Circuit. 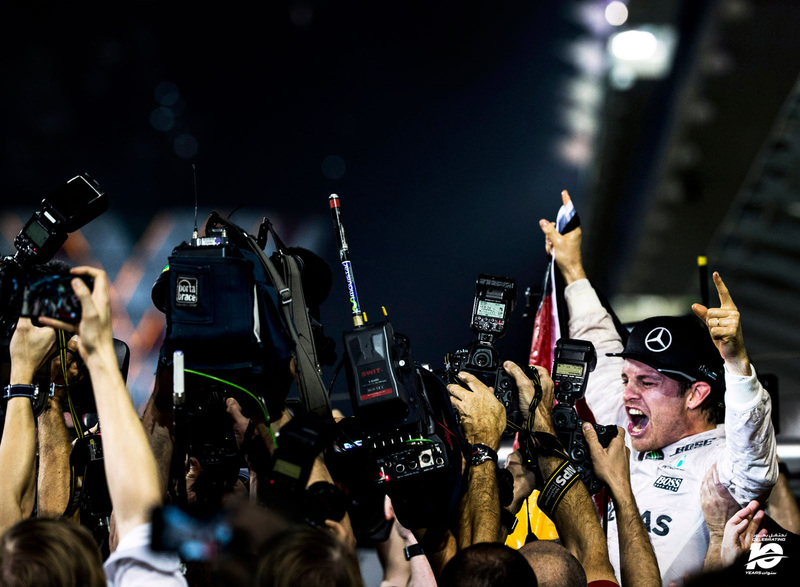 The F1® photographer not only shares beautifully captured moments from 2009 until now but also offers commentary and a retrospective story about each striking shot. 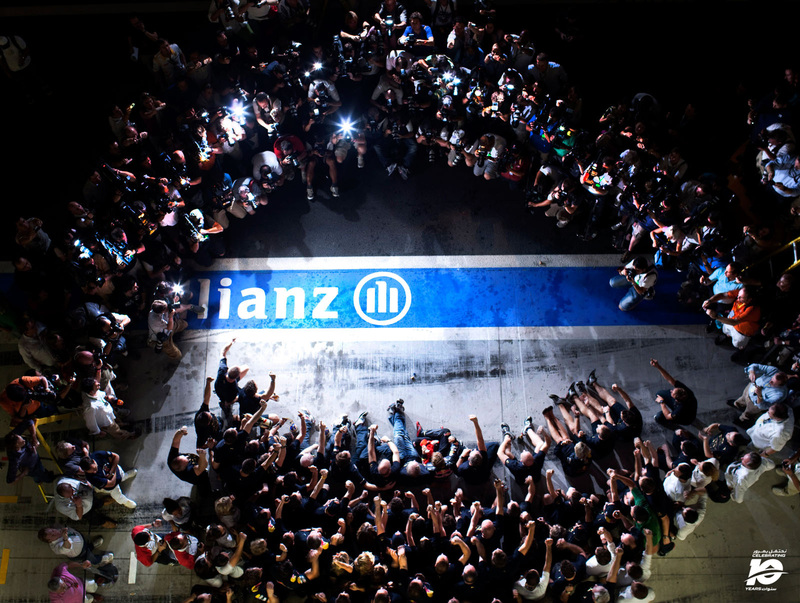 Team celebrations can offer the Formula 1® photographer some special opportunities for interesting pictures. Taking a gamble, I climbed to the very top tier of the pit lane Grandstand and hoped to get something a little different of Sebastian Vettel and his Red Bull team celebrating the German driver’s title victory. As luck would have it the Circuit authorities switched off the pit lane lights at just the right time resulting in way more dramatic lighting than there would have otherwise been. My gamble paid off! 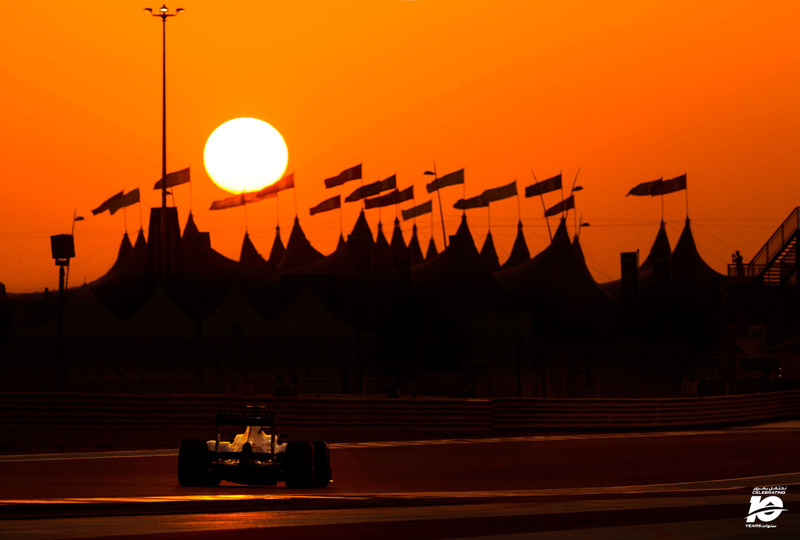 Looking for all the world like a scene from a David Lean blockbuster movie, classic silhouettes of Bedouin tents stand in front of a perfect bright yellow setting sun providing a stunning backdrop to the Mercedes of Lewis Hamilton as he races towards this wonderful vista during the 2013 Abu Dhabi Grand Prix. I’ve always been a fan of race circuit venues that use the areas that surround the track in a creative manner. Colourful lines, shapes and designs can really add to the overall spectacle of a Grand Prix venue so you can imagine my joy when I first saw the brilliant way Yas Marina Circuit’s designers had utilised their track’s kerning and run-off areas. 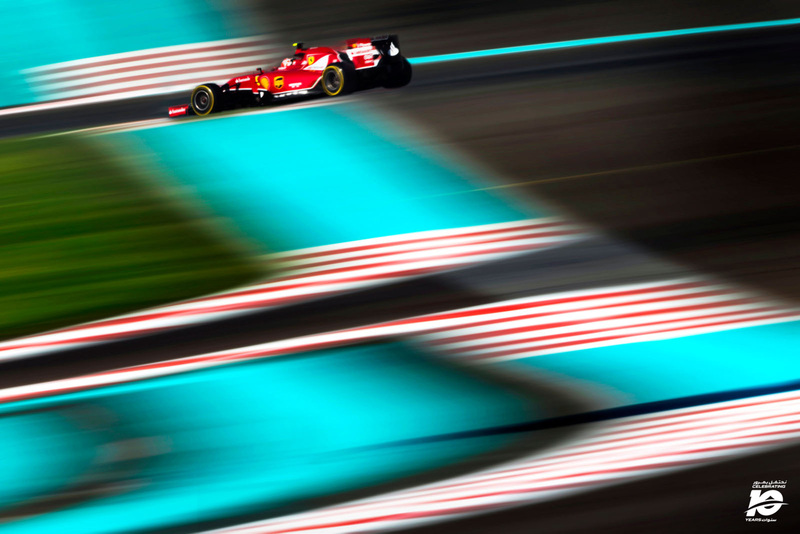 Here you see Kimi Raikkonen slicing his way through the designs during the 2014 Abu Dhabi Grand Prix weekend. 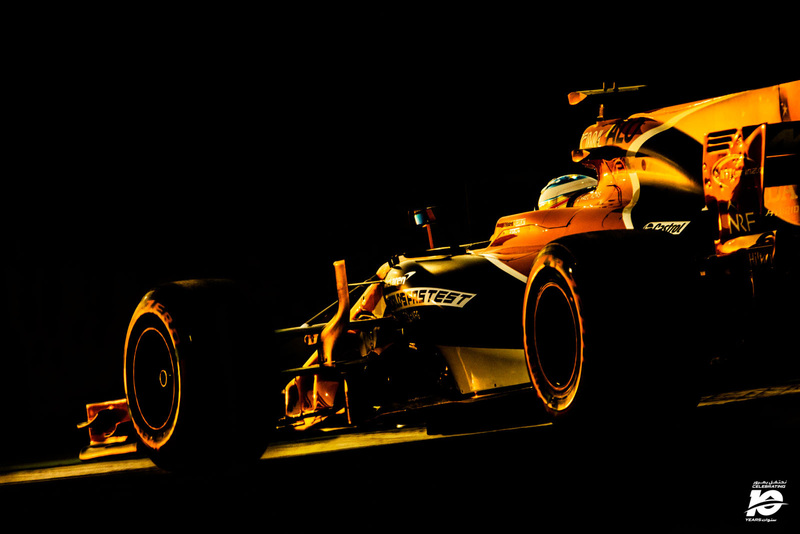 Fernando Alonso’s orange, black and white McLaren looks stunning bathed in the light of an Abu Dhabi sunset during qualifying for the 2017 event at Yas Marina Circuit. ‘Light and the patience to wait for it’, is a mantra I firmly believe in so when all the elements combine to produce a visually arresting image, I couldn’t be happier. 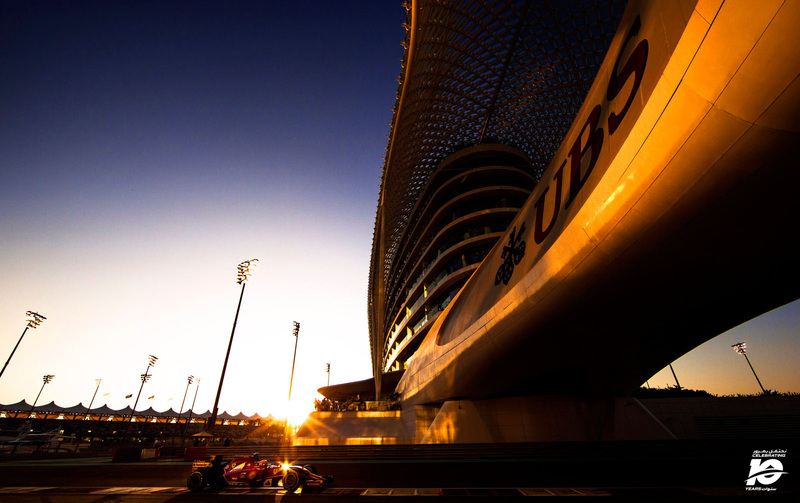 Photography Courtesy of Darren HeathKimi Raikkonen races hard as he heads underneath the Yas Hotel Abu Dhabi during the 2014 Abu Dhabi Grand Prix. 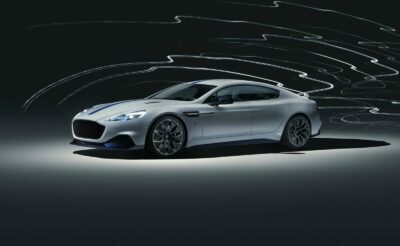 This is a tricky shot to shoot as the photographer – due to the surrounding fences – is unable to pan the camera with the motion of the car. Capturing the setting sun and a perfect starburst highlight off the Ferrari only adds to my happiness with the picture you see here. Standing atop his Red Bull car Sebastian Vettel salutes the crowd after winning the inaugural Abu Dhabi Grand Prix at the stunning Yas Marina Circuit. Winning here in 2009 was the perfect way to finish the season and set him up perfectly for championship victory just one year hence. 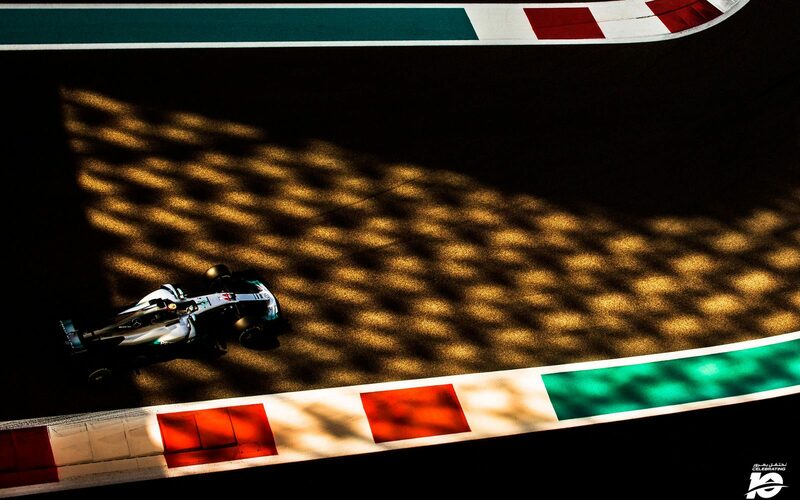 Positioning myself on a balcony overlooking the Circuit, the gorgeous shadows created by the lattice work shroud of the Yas Hotel Abu Dhabi provided a wonderful palette on which to photograph the passing Formula 1® cars during practice for the 2017 Abu Dhabi Grand Prix. Light and shade are elements the creative photographer should always be on the lookout for. During the F1® season no other venue provides so many such opportunities as Yas Marina Circuit. 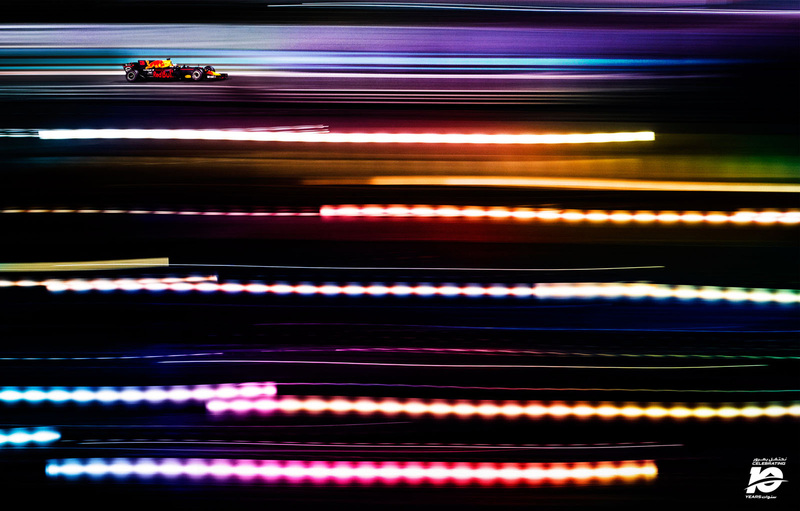 Daniel Riccardo’s Red Bull car races past the complementary colours of the foreground lights. Choosing a vantage point I’d not photographed from previously, I waited for qualifying to begin for the 2017 Abu Dhabi Grand Prix. Noticing the lights in the foreground I practiced some very slow shutter speed pan shots and liked the streaks that resulted. Repeating the same shot as the cars passed, I’m glad I ventured to somewhere new! 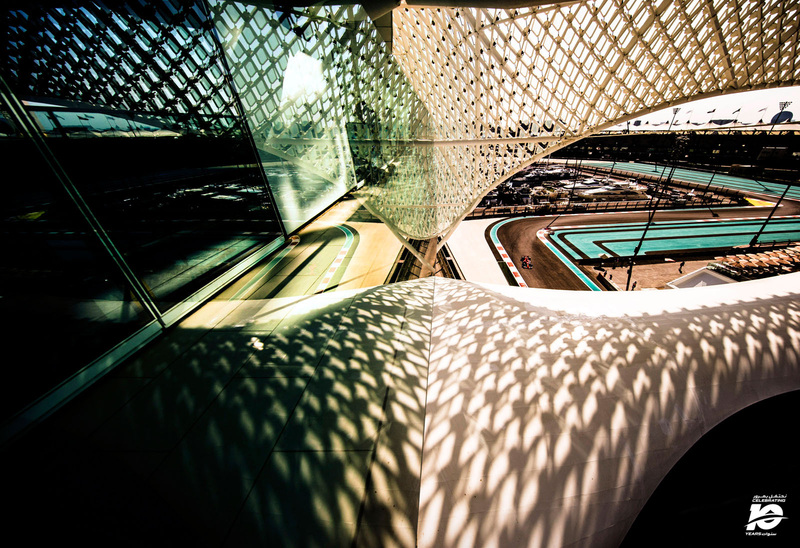 I’ve always been interested in architecture so a trip to photograph Formula 1® cars racing around the visually impressive Yas Marina Circuit is always a treat. Every year that passes it’s of paramount importance that I try to see different photographic opportunities to previous years. For one of the 2017 Abu Dhabi Grand Prix practice sessions, I secured access to a balcony I’d not previously shot from. The resulting capture you see here is one of my favourites of the year. Turning on my heels and running away from the throng of photographers snapping the new drivers’ World Champion may seem like a foolhardy choice. Prior to Nico Rosberg being hoisted high by his mechanics, I decided to gamble on getting the shot you see here. The feeling of elation I get when a shot comes together in the viewfinder makes all the effort worthwhile. Shot ‘in-the-can’ I turned away and punched the air every bit as hard as the celebrating Mercedes driver! See part one of this two-part photo series.